Once upon a time the waters of the Gulf of Mexico sp arkled like a precious jewel of emerald, diamond and aquamarine! 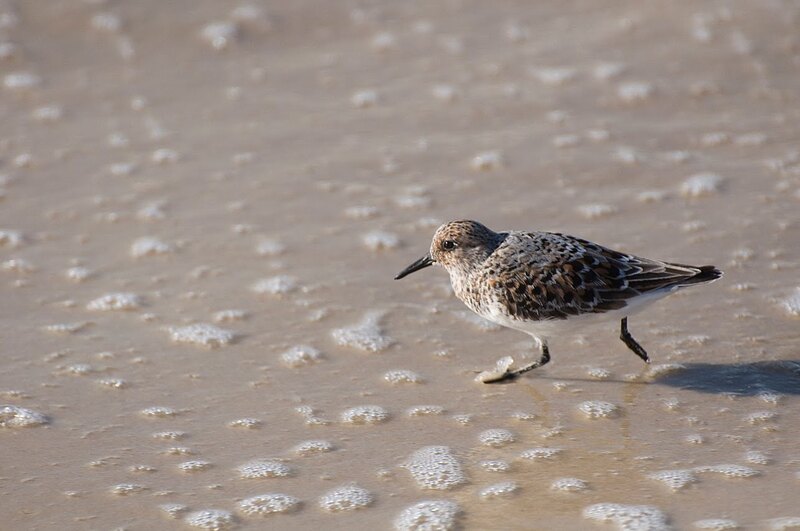 Birds, such as sandpipers, Snowy Plovers, Pelicans, gulls, terns, Black Skimmers, herons fed on the fish and tiny creatures in its waters and along the sugar-white sands of the s horeline. Sea turtles came ashore to lay their eggs in the sand above the surf line each summer. The beaches were alive! Sargassum weed, seaweeds, surfgrass and other plants from distant waters floated on the currents and washed ashore along the beaches providing food for countless numbers of tiny creatures such as Beach Hoppers (left) and beetles. 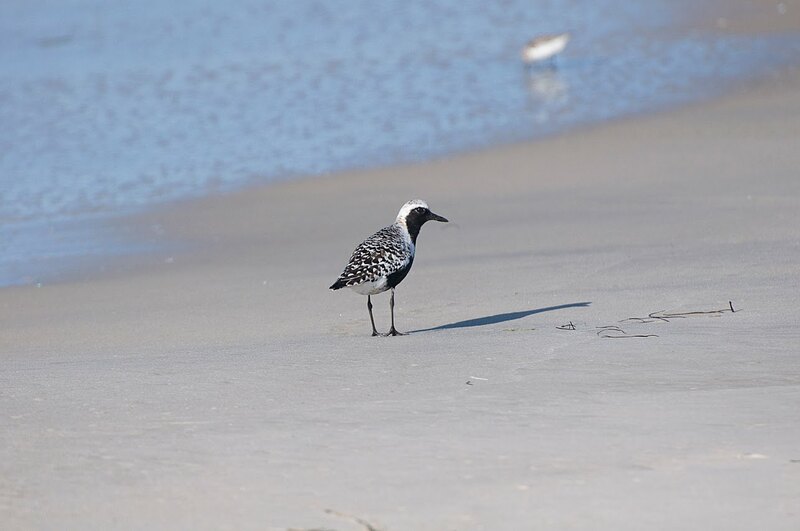 Thes e often overlooked, but extremely important minute an imals provided food for numerous other animals like crabs (right) and shore birds including Red Knots, Black-bellied Plovers and Sanderlings. Many of these birds used the beaches, sandbars, estuaries and saltmarshes along the Gulf as "fast-food joints," filling up on fuel as they flew from their wintering grounds in Central and South America to their breeding areas as far north as the Arctic. Sadly, even if they do not get covered with the sticky oil, these birds may slowly starve as their food supply vanishes beneath the toxic sludge. Most visitors to the beach are not aware of the unseen ecosystem beneath their feet as they walk along the surf. Those tiny holes that a pear in the sand often form from bubbles that rise as the water flows back with a retreating wave; animals such as mole crabs, clams, beach hoppers, tube worms and even microscopic animals living on individual grains of sand depend on the food and oxygen provided by the constant ebb and flow of the waves. 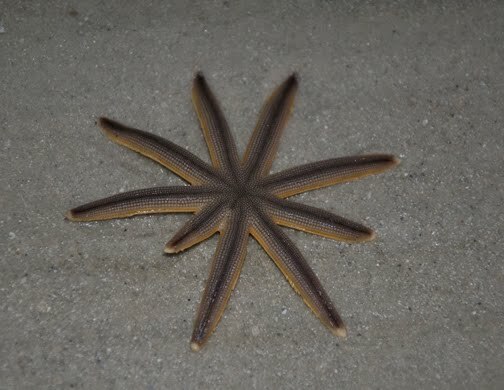 Shore birds, stingrays, and small fish glean these animals from the sand. These small animals make up the base of the food web, without them, the "strings" of the web begin to break and whole ecosystems collapse. 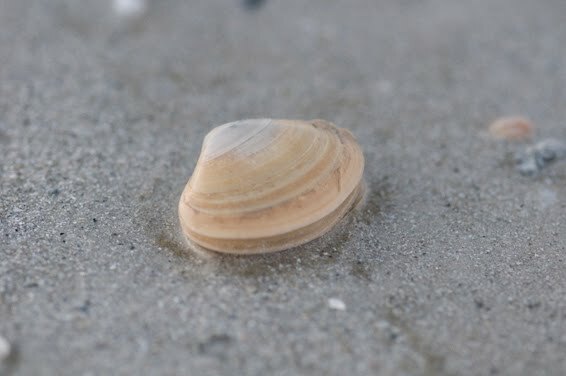 Just offshore sand dollars, starfish, sea urchins, scallops, oysters, mussels, clams and other shellfish filter plankton from the water and they in turn provide food for others. 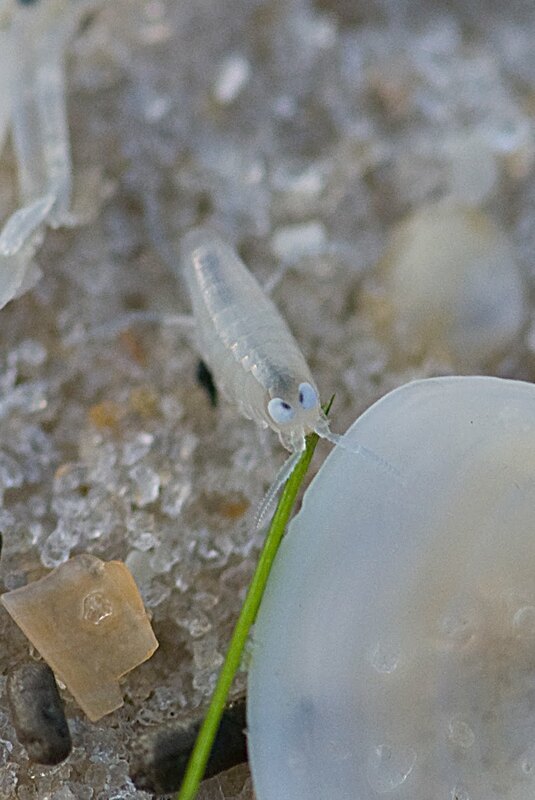 It is not hard to understand how toxic chemicals from the oil and the dispersants will eventually kill all of these creatures and those that feed on them; before long the marshes and beaches will turn into graveyards reeking of dead fish, birds, crabs, plants. and on and on. A lot of emphasis has been placed on the impact of the oil on the islands, mouth of the estuaries and marshes off the Louisiana coast. The estuaries, where freshwater rivers meet the sea, and salt marshes are very important nurseries for fish, crabs, birds and other animals. These areas also serve as feeding areas for numerous birds and other animals. It is heartbreaking to see the photos of oil-covered pelicans, gulls, terns and others on the news each evening. As the oil gets into the loop current in the Gulf and begins to spread eastward the tragedy will be repeated in marshes, on beaches and mangrove swamps over and over again. The schools of dolphins that feed just off shore each morning will have to move on or be in danger of being poisoned or suffocated by the floating oil. 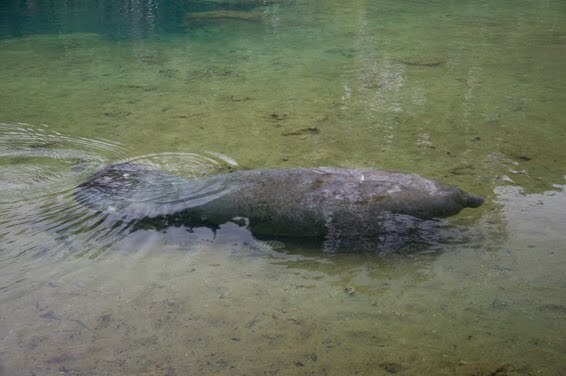 I worry about the manatees as they will eventually have to return to the warmer waters of the rivers next fall. 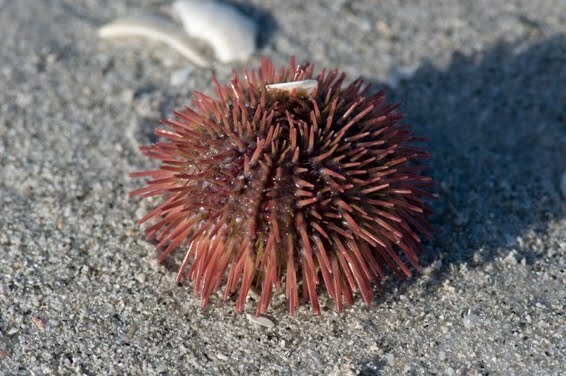 Will they be able to find the seagrass they depend on for food? Will they be smothered in gooey oil as they surface to breathe? 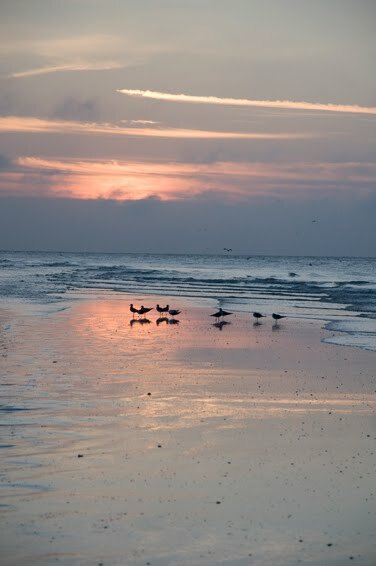 Anyone who has ever walked the beaches of the Gulf, eaten the delicious fresh seafood, fished from a pier or boat far fro m shore, appreciates the beauty and natural bounty of the area. For the people who live along the coast and have to make a living from the fishing the waters or from catering to the tourists, my heart goes out to them. As a visitor to the Gulf beaches, I can only keep wonderful memories of the animals and plants I have enjoyed over the past 50+ years. I hope I can live long enough to see the Gulf return to its former glory! I hope my fears are not realized, but it is not encouraging knowing the size and severity of the oil spill. I hope these beautiful birds of Florida do not become nothing but a memory in a few months! Such a touching tribute! I hope the worst doesn't happen. You really feel helpless in the vastness of this man-made disaster. My heart goes out to all the helpless birds, fish and animals. Life as we know it here along the gulf coast is about to be changed! And who knows how many years, if ever, it will take to recover! It is so gut-wrenching to watch happen and there is absolutely nothing we can do.